Computers, Computation, Computerisation and Artificial Intelligence, the "Exploration Tree"
The first edition of this book was welcomed with great enthusiasm by teachers and students. It therefore seemed opportune to publish a second, revised, updated and extended edition. Unfortunately, Professor Fèlix Serratosa died before he could complete this task. Some new material has been added, the more significant changes being:. 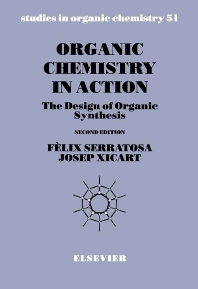 The book has been restructured into two well-differentiated sections: Part A, dealing with conventional organic synthesis, and Part B, devoted exclusively to computer-assisted organic synthesis and based on the former Chapter 11 and Appendices 2, 3 and 4 of the first edition. As decided in advance, Part B was to be the sole responsibility of Dr. Josep Xicart, who prepared the first versions of the CHAOS (Computerisation and Heuristics Applied to Organic Synthesis) program under the direction of Professor Serratosa.